Presents inference and simulation of stochastic process in the field of model calibration for financial times series modelled by continuous time processes and numerical option pricing. Introduces the bases of probability theory and goes on to explain how to model financial times series with continuous models, how to calibrate them from discrete data and further covers option pricing with one or more underlying assets based on these models. Analysis and implementation of models goes beyond the standard Black and Scholes framework and includes Markov switching models, Lévy models and other models with jumps (e.g. the telegraph process); Topics other than option pricing include: volatility and covariation estimation, change point analysis, asymptotic expansion and classification of financial time series from a statistical viewpoint. The book features problems with solutions and examples. All the examples and R code are available as an additional R package, therefore all the examples can be reproduced. Stefano Maria Iacus, Professor (Professore Associato) of Probability and Mathematical Statistics at University of Milan, Department of Economics, Business and Statistics. Stefano is a member of the R development Core Team. 1.1 The World of Derivatives. 2. Probability, Random Variables and Statistics. 3.1 Definition and First Properties. 3.8 Counting and Marked Processes. 3.14 More Properties and Inequalities for the Itô Integral. 3.16 Girsanov's theorem for diffusion processes. 3.17 Local Martingales and Semimartingales. 3.19 Stochastic Differential Equations in Rn. 4.5 Simulation of Stochastic Processes. 5. 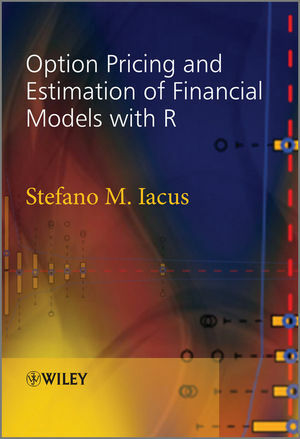 Estimation of Stochastic Models for Finance. 5.3 Short-Term Interest Rates Models. 5.5 Telegraph and Geometric Telegraph Process. 6.2 Solution of the Black & Scholes Equation. 6.3 The Hedging and the Greeks. 6.4 Pricing Under the Equivalent Martingale Measure. 6.5 More on Numerical Option Pricing. 6.6 Implied Volatility and Volatility Smiles. 6.7 Pricing of Basket Options. 7.5 Geske & Johnson and Other Approximations. 8. Pricing Outside the Standard Black & Scholes Model. 8.1 The Lévy Market Model. 8.2 Pricing Under the Jump Telegraph Process. 9.1 Monitoring of the Volatility. 9.4 Clustering of Financial Time Series. A. 'How to' Guide to R.
A.1 Something to Know Soon About R.
A.6 Parallel Computing in R.
B.1 Overview of Existing R Frameworks. B.2 Summary of Main Time Series Objects in R.
B.3 Dates and Time Handling. B.4 Binding of Time Series. B.5 Loading Data From Financial Data Servers.